The results of a recent bone density test revealed I have some bone loss. I am 54 years old. How can yoga help rebuild bone mass? Yoga’s weight-bearing postures affect your whole spine, arms, shoulders, elbows, legs, knees ankles, and feet and encourage full range of motion which encourages the increase of bone density.Yoga also has lots of stretching, which we now understand also stimulates new bone growth. B.K.S. Iyengar believes that inversions that bathe your thyroid and parathyroid in blood help to rejuvenate these glands, aiding your body in giving it the nutrients it needs. Twists and forward folds help to regulate the adrenals which help to provide estrogen and androgen for healthy bones. Through the practice of yoga, you will gain posture, coordination, strength, flexibility and balance, all which will help prevent falls. On our membership site we have a 48 minute class specifically for osteoporosis as part of a series of classes for menopause. 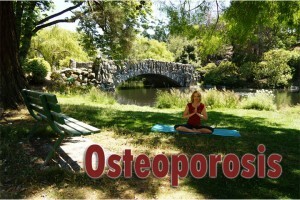 Today I will show you one of my favourite postures for osteoporosis, sphynx poses. It helps to build bone density in your upper back and prevent kyphosis.